Clotholine® is the first active ingredient that actually makes people feel better when they use it. This new cosmetic ingredient demonstrably prevents the signs of aging while increasing the sense of well-being in participants. Below you will find a summary of our Clotholine® presentation for SCS Formulate 2015. Please join us in room B on November 17th, 2015 from 15:15 to 15:30 for the full presentation. We’re already looking forward to meeting you there! Clotholine® was developed by SYNTIVIA for the account of SOLLICE BIOTECH. The ingredient is distributed by BLAGDEN in the UK. It activates longevity protein Klotho, a novel biomarker. 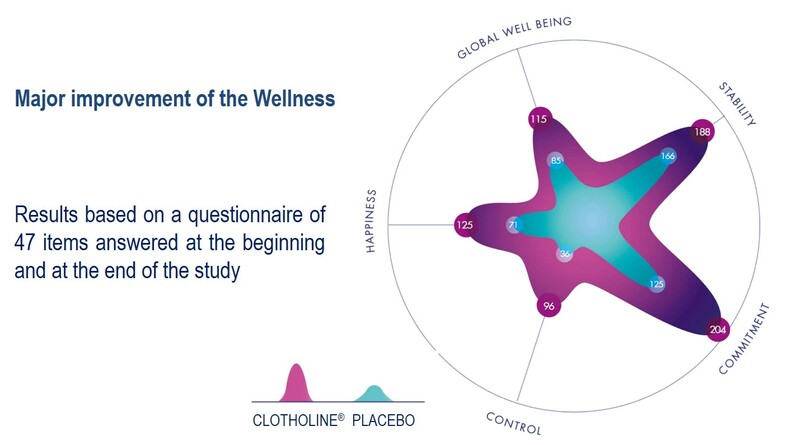 Our custom study shows that participants experience an improved sense of “well-being” after two months of use, based on quantitative results and confirms that these results are coherent with the more classical approach of in vitro and instrumental clinical studies. Our study also demonstrates that Clotholine® has a powerful effect on skin aging and balances cell metabolism while maintaining normal cell activity (proliferation, ECM synthesis). Clinical tests not only confirm that Clotholine®’s active ingredient restores youth activity via its action on Klotho and its influence on cell homeostasis. Clotholine® also improves skin radiance and micro relief as well as the sense of well-being after 2 months of use. The results obtained in the course of this study illustrate SYNTIVIA’s scientific expertise and know-how in cosmetic studies. Please contact us for more information.